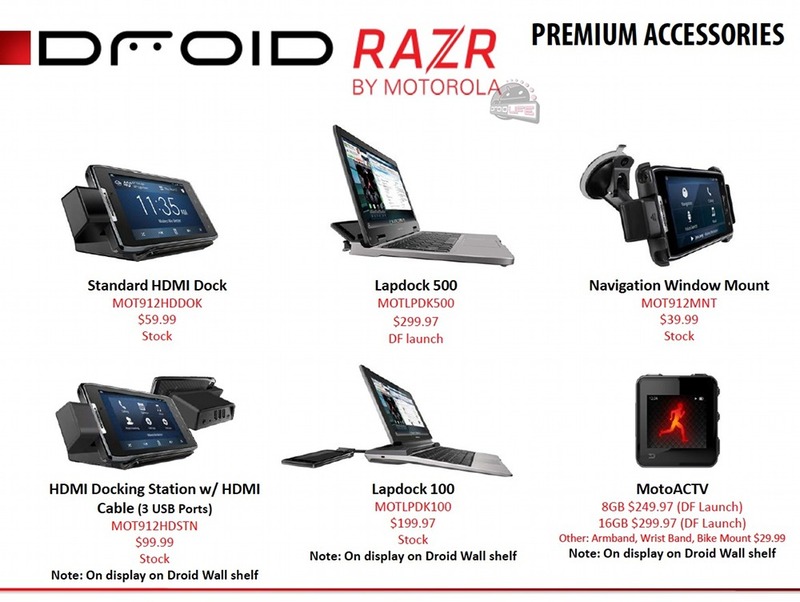 If you pre-ordered a DROID RAZR today, then you are likely looking at the massive list of accessories that can accompany it. HD Dock in mind? One of the two Lapdocks catch your eye? What about MotoACTV, Motorola’s fitness watch that can notify you of texts, calls and calendar items? Well, you now know exactly how much you will be paying for each of them on November 10 (the date Verizon told us to expect the device). Speaking of the MotoACTV watch, it looks like you won’t be able to pick them up in stores, hence the “DF” note on there. “DF” stands for Direct Fill which means that Verizon would have to order it for you. If you want one, remember that they go on-sale November 6 at a variety of big electronics stores and REI for $249.